After filling up our tummies with some good stuff from Oh My Gulay, our group headed to Session Road to meet another Baguio-based friend. 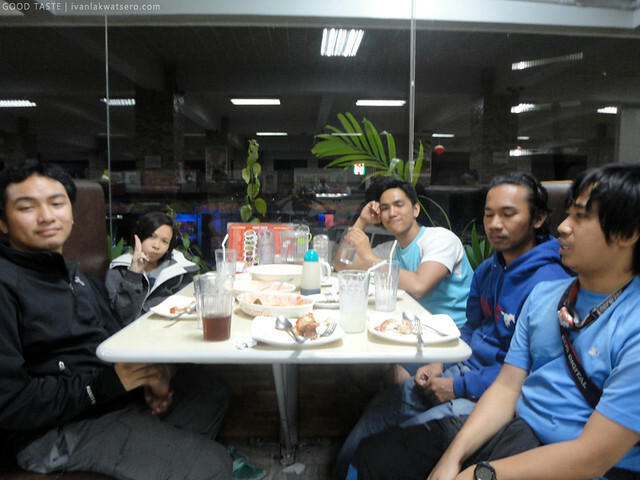 My blogger friend Emil of Asiong 32 is our resident tour guide for the rest of our stay in Baguio City. Since we really have no idea where to spend Saturday night in Baguio City (hindi naman kami yung grupo na mahilig sa gimikan at inuman so we prefer something adventurous), we asked Emil to join us, or probably show us a great place to kill time in a night time Baguio City. "Mag-ghost hunting tayo sa Teachers Camp [Let's ghost hunt at Teachers Camp]," he suggested. At first, I was like, "ah ok, that's interesting," but surprisingly, he was serious about it pala. Personally, I am not a fan of such spooky activities, madali kasi ako matakot sa mga ganyan ganyan I usually get petrified, as in naninigas talaga ako at halos hindi makasalita. But since I'm with a group of true blooded thrill-seekers, wala na akong nagawa kundi jumoin na lang, bring it on! Equipped only with 2 headlamps, a handheld flashlight, cameras and a bagful of courage, we went to Teachers Camp at 08:00 PM. I am not familiar about the story behind the Teachers Camp aside from the fact that it was a teachers camp but I've heard before that there were indeed sightings of ghosts in the area. 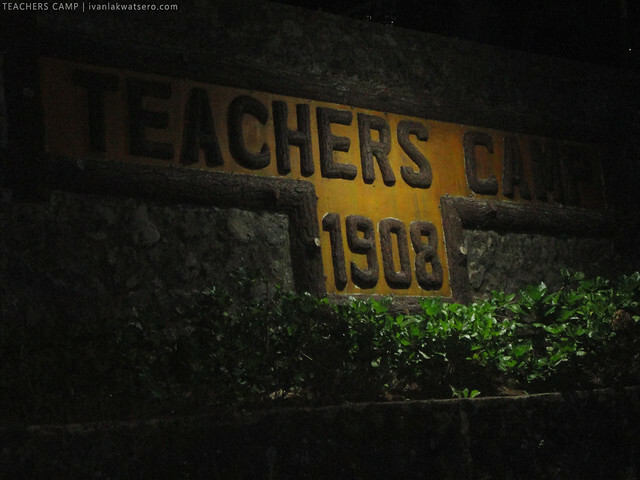 During the American Period, Teachers Camp was originally allotted to accommodate teachers from all over the country when they're up in Baguio City for their summer training or seminar. Philippine Military Academy also occupied a large part of the whole camp before it moved to Loakan Area near the airport. Teachers Camp continues to serve as transient accommodation up to this date. While walking around Teachers Campsite, we encountered no strange or unusual things. Inside my head, I was wishing na sana may magpakita naman kahit isa lang para hindi masayang ang pagod namin. 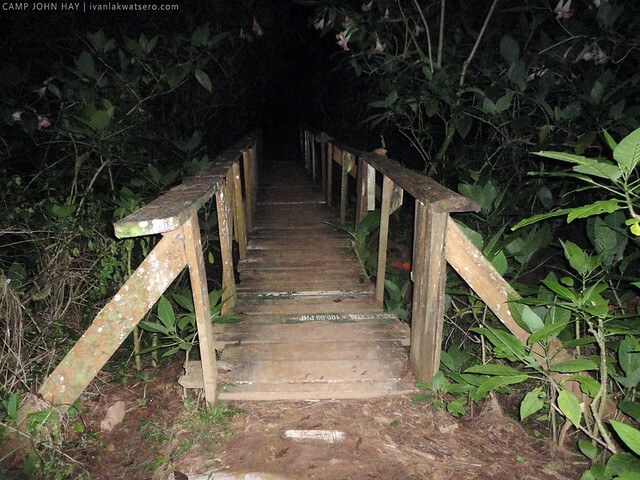 The experience was becoming more like a night time fun walk than an actual ghost hunting. 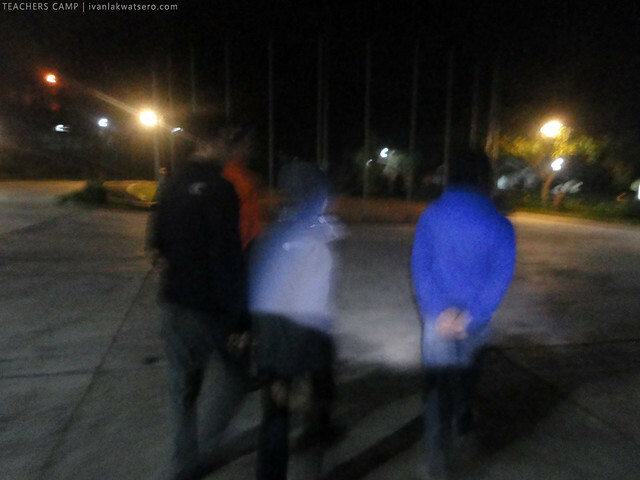 Eventually, at around 08:45 PM, we reached the end of Teachers Camp and decided to walk further to Camp John Hay still to hunt the unseen. The walk continued to more than an hour now but apparently there was still no sign of ghosts or spirits. This ghost hunting thing seemed to be a failure after all. Past the Mile Hi Center, we turned right to Eco Trail. Meron din daw kasi ghosts sa area na yun. 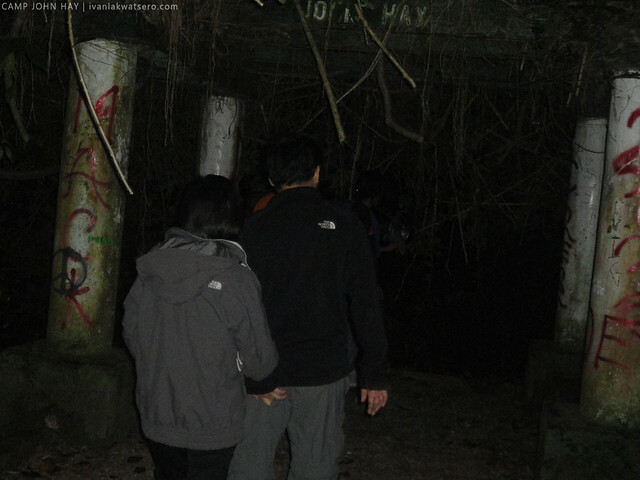 It was really dark and cold inside Camp John Hay's eco trail, we were alone. I was a bit tired after walking for more than hour in search for ghosts, pero wala naman nagpapakita. All I want by that time was to finish the activity, have dinner somewhere, than fall into slumber inside our hotel. It was really dark and cold and silent that night. 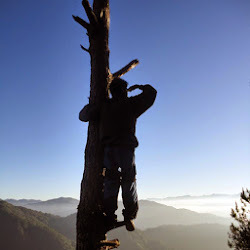 There was nothing unusual, as if we're just night trekking a trail to a mountain's summit. It was really dark and cold, I wish there was a ghost but there's none. After about 10 minutes from the time we entered the eco trail, I noticed something on the ground, didn't tell anyone but I know those were drops of blood. I just ignored it. It was a dark and cold night when all of a sudden, our friend Bryan shouted, "may dugo [there's a blood]." We walked and looked closer to the rock where Bryan saw the blood. It was indeed blood spewed all over (I know it is blood, and I know it's the same blood I saw earlier). We then had this strange feeling, frightened I guess. It was a dark and cold and frightening night, we decided to discontinue trekking traverse to Nevada Square. We were afraid that we'll encounter a psychopath with a chainsaw or a cannibal witch doctor along the way, kung anu-ano na ang naglalaro sa utak namin. That's pretty much scarier than having a ghost sighting. We walked fast, heart beats were fast as well. Nakahinga kami ng maluwag upon seeing again the street lights. Whew. It was a strange heart pounding experience. 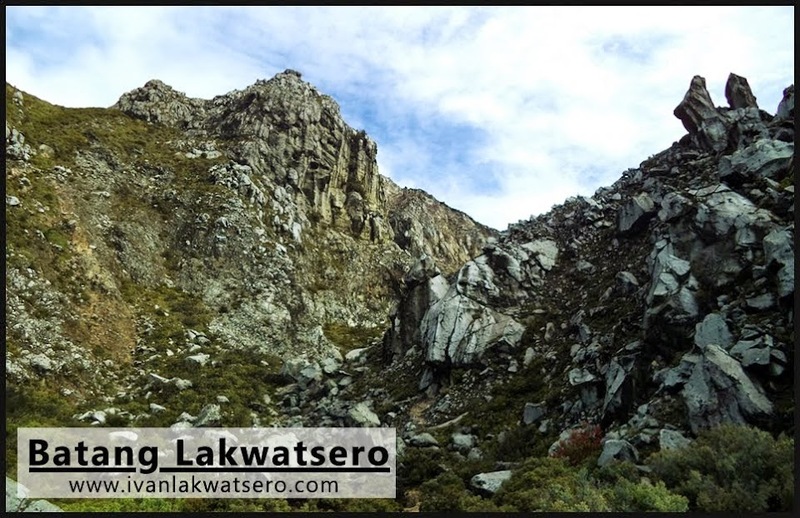 Sa sobrang taranta, hindi ko nakuhanan ng picture yung dugo. We just rested for a few minutes to catch our breath before we decided to call it a day. But before we finally ended the day, we went to Good Taste Restaurant for dinner. Buti na lang talaga masarap yung ulam namin na Garlic Buttered Chicken, somehow nakalimutan namin yung scary experience namin. Good Taste saves the day! Nakakaloka... Baka may napadaan doon na may menstruation. Charot! Hahahaha! Hindi mo makikita ang hinahanap niyo kasi madalas gulpi-de-gulat ang ginagawa ng mga supernatural na yan. Yung dugo, baka may nangyari lang predation somewhere before niyo nakita yung dugo like in Malarayat... meron traces of blood nakita tayu sa may water source..si Sir Bogart unang nakakita.